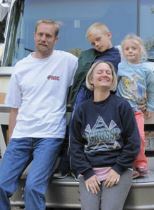 Quality construction makes 1970s FMC motorhomes popular with 21st century travelers, including Liza Lee and Greg Miller and their children. Owners of these rare 1970s high-end motorhomes enjoy driving, restoring, and simply preserving them. In their day, FMC motorhomes were prized as the pinnacle of luxury. Clint Eastwood, Pat Boone, and Carol Burnett all are said to have owned FMCs. The last of the six motorhomes that news correspondent Charles Kuralt used while hosting his popular “On The Road With Charles Kuralt” TV segments was an FMC. Jim still owns the first FMC prototype, and he is among the most knowledgeable of the people who work on these coaches. He, like many classic coach aficionados, holds FMC coaches in high esteem. Like another 1970s motorhome, the GMC, FMC motorhomes were built in a very streamlined shape, low to the ground (by today’s standards), and on the manufacturer’s own custom chassis. But that is where most similarities end. FMCs have rear engines and rear-wheel drive. They were all 29 feet long. A hallmark of the FMC was its luxurious, European-engineered four-wheel independent suspension. A sales brochure for the 1973 model motorhome noted, “The handling is unlike any motor coach you’ve ever driven “” unusually smooth, stable and quiet.” Any FMC owner today will agree that the ride is still a big selling point with these motorhomes. FMCs also had optional Michelin tires and a 6.5-kilowatt generator. Backup lights with a warning buzzer and wheel covers were standard. Air-conditioning was standard, as were a porch lamp, floor lamps, an electric entry step, and the generator. Inside these penthouses on wheels were deep shag carpeting and vinyl wall fabric. Even the interiors of the cabinets were carpeted to reduce noise and vibration. All this and much more went for a whopping price of approximately $29,500 for a 1973 model “” about the same as the median price of a stationary American home at the time. By 1976, the FMC’s sticker price had risen to $55,000 or more. In spite of the FMC’s upper-echelon cost, Jim said they were very much in demand. Even so, only about 1,050 came off the factory floor. The Arab oil embargo slowed sales from the outset, and by the mid-’70s Food Machinery Corporation had signed a government contract to build tanks. It began retooling the factory, and the FMC motorhome was history. It is estimated that 700 or so FMCs are still “alive” somewhere on the road. FMCs are rare, indeed. FMCs have plenty of fans to thank for their survival. Among them are members of the FMC Motor Coach Owners Club, a Family Motor Coach Association chapter founded in October 2000 whose members own FMCs. For dedicated chapter members, keeping these homes on the road is a labor of love. Some of them spend many dollars and countless hours switching out engines, renovating interiors, and tinkering with transmissions. The first president of the FMC Motor Coach Owners Club, Lenny Mach, bought his FMC in 1995 and gave it a shiny exterior, plus new appliances, holding tanks, wiring, and dash. He installed a 230-horsepower Detroit Diesel power plant in place of the original gas engine. The work was worth it. Lenny said he wanted his motorhome to “look and drive like a new coach, and have a unique style, instead of a square box.” And at 14 miles per gallon, it does make sense to switch to a diesel, he added. Some FMC owners over the years have moved the original house air-conditioning system to the roof; doing so creates more storage space in the accessible part of the coach. Another popular change is to add house batteries for dry-camping purposes. (Original FMCs came with two 6-volt house batteries.) New appliances, floor coverings, cabinets, seating, windows “” owners have added all these and more to their coaches. But why go to all that trouble? Why not just buy a newer coach that already has these things? The FMC’s handling and ride is one reason; but, mostly, it’s a matter of style and preference: the idea that what you have is unique, or close to it. The coach’s low profile and quiet cockpit also make it very appealing to buyers. “I want to travel light, be able to go most anywhere, hang a U-turn in most intersections, go through parking lots or small mountain roads and not worry about scraping the top of the coach, be able to talk to my wife in a normal tone of voice, and not use an elevator to get in or out of the coach,” Stephen said. Instead of redoing his FMC, the current president of the FMC Motor Coach Owners Club, Bill Sitton, has taken pains to keep it original. Bill owns a 1976 FMC, number 902 (built in 1975), which had 40,000 miles on it when he purchased it, and has 52,000 now. It’s almost the same as it was when it was made, except for engine parts and wheels. Bill said he stumbled into FMC ownership by learning that a coach had been stored in a barn in his area for 17 or 18 years. “Nobody could get it running. I spent about a week to get it going,” he said. Bill had been a Chrysler mechanic for many years, and coincidentally, his coach, like many FMCs, came with a 440-cid Chrysler Marine Industrial V-8 engine. The FMC still had its original eight-track tape player, too. Bill took it out in favor of a stereo with a CD player but wound up putting the eight-track back in. “Really, the eight-track worked better, because of wiring,” he said. Since acquiring his first FMC, Bill has purchased two more FMCs “” one to use for parts and another (number 100) to be restored in the future. But his first FMC is about as original as it gets. “I won’t let myself drill a hole in it,” he said. “I guess if I had a problem that would be another story, but I’m pretty happy with it the way it is. “They did a good job of it when they designed them,” he added. If you would like more information about FMC motorhomes, or if you already own one and would like to join the FMC Motor Coach Owners Club, visit the chapter’s Web site at www.fmcowners.com. Approximately 135 of the FMCs built were configured as transit buses. These did not contain a driver’s-side door. It’s estimated that half of the remaining buses have been converted to motorhomes. FMCs had two foldable cross-aisle doors that let occupants create a private bed-and-bath area, or just a private rear bedroom area. The official name of the coach was the FMC 2900R, with the R indicating it was a rear-engine coach, and the 2900 denoting its 29-foot length. By 1975 FMCs came with several new standard features, such as an electric entry step, lighted closets, engine compartment lights, a rear-mounted spare tire with cover, and two additional sleeping spaces (bunk beds that folded down from the ceiling). A microwave oven was available as an option. FMC Corporation today focuses on agricultural, specialty, and industrial chemical markets, and mining. Floor plan: Basic floor plan had convertible front dinette and rear dual-lounge seats that converted to twin beds or queen bed. Sofa-lounge floor plan had L-shaped sofa in front with “tuckaway” tables. A third floor plan in later models offered rear fold-down bunk beds.